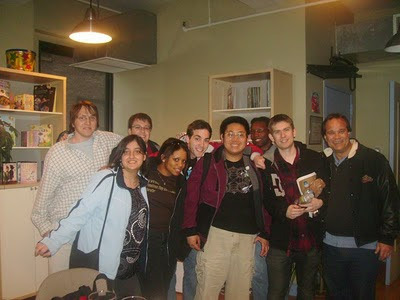 Anime/Game Voice Acting Advanced Class with Bang! Zoom! Was going to post this sooner but it's abviously not be a normal week with all that is happening in Japan. 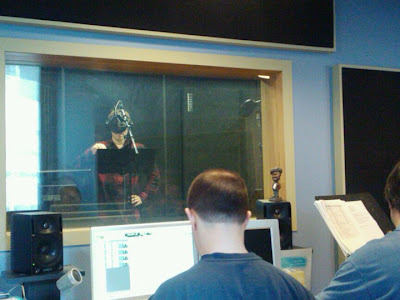 To throw some positive note into the blog today, last Sunday I spent the day in NYC taking the new Advance Anime and Game voice acting class with anime voice legend Tony Oliver and Bang! Zoom! studios. Like the two courses I took last year, the class was held over at Edge Studios, the same studio famous for a number of voice overs including much of what you see on say the History Channel. It was great to get back in the booth and to erase any cob webs that might have kicked in since last year. This class was particularly helpful since we got to do a mock voice audition at full speed. We alot went full sped in doing a few mock video game voice overs. Since we already knew the basics, it was mainly a class of fine tuning, removing any remaing butterflies in our stomach and to fully prep for a real audtion. Great thanks of course to Tony for yet another great teaching job and Paul, the engineer for the recording. What's left for me is to fine-tune a few stock voices I have , make a demo and get out there for some auditions. In the coming year here's hoping you'll hear me in some real anime and video game dubs. If by any chance you run any original animations, games, web commercials, etc you'd like me to audition for, email me at ctgaffney@gmail.com or here at orders@chucksanimeshrine.com. For those who were in the class. I might eventually do a commercial for my anime store and I'll probably ask for some voice samples... could be something to add to our voice resume and since my anime store is a legit business, it could maybe open some doors. Facebook and/or message me when you can.